Ever stare at worksheets containing very large data sets of data and have no idea where to start? How do you break down your data to extract what you need in a meaningful way? 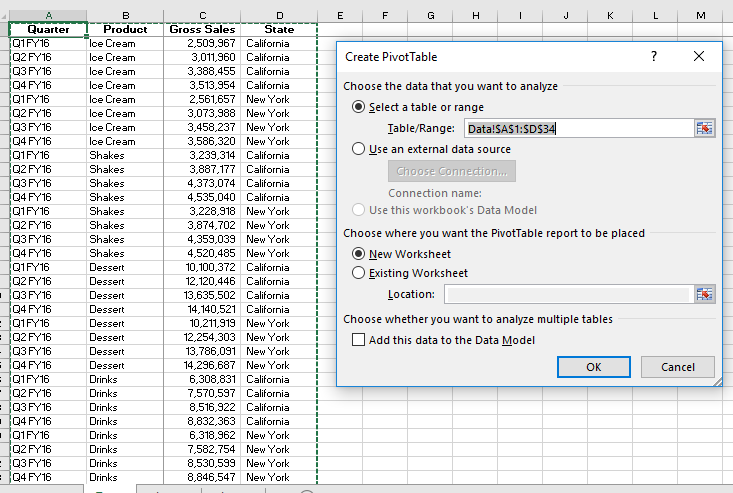 Welcome to the power of the pivot table. A pivot table allows you to take the systems data dump and quickly organize it for meaningful analysis. And even with the grandest of accounting and finance software systems — and the fanciest standard reports — pivot tables are easy to create and invaluable to your reporting. 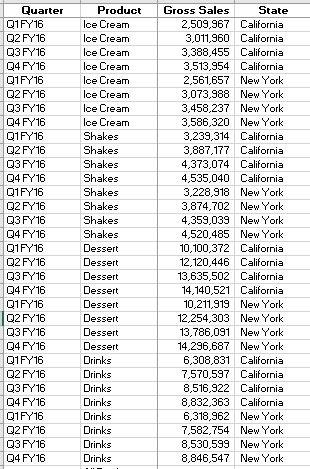 As an example, let’s use data that was extracted from an accounting system for an ice cream shop. The spreadsheet below shows gross sales by quarter, by product, across two locations. To start, make sure your data is organized in a tabular format and does not have any blank rows or columns, as follows. 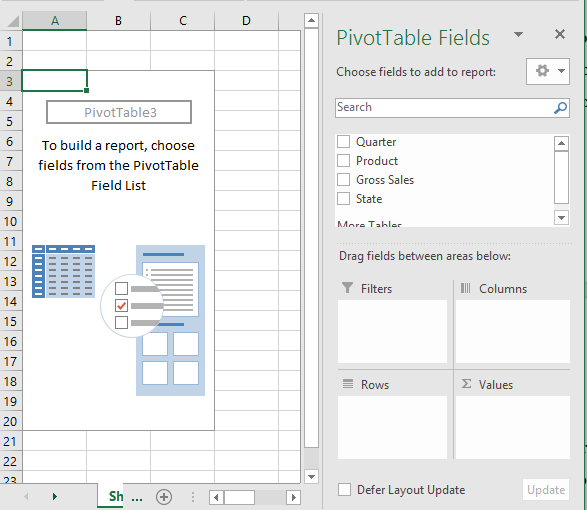 The below pivot table field list will then appear. 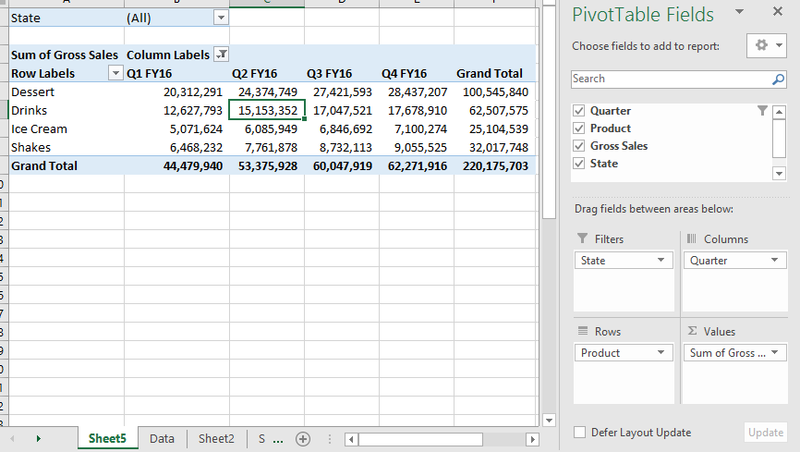 Select and drag the different fields into the filter, column, rows and values in order to achieve your objective with your pivot table. Drag Quarter to the Columns areas, Product to the Row areas, Gross Sales to the Values area and State to Report Filter. In the “Values” area you have the option to sum, count, etc. You might have to edit this (mine doesn’t always show up as sum). The “Filters” gives you a drop-down menu so you can toggle between all or a selection of states. Would you like to leverage more advanced capabilities in Excel that can make an immediate impact on your organization? Keep in mind that 8020 Consulting is here to help. Just click on the button below to ask us a question or learn more.